If we want to have independent-minded elected officials representing us in Philadelphia, electing officials who are actually independent makes a lot of sense. Philadelphia is dominated by officials who are, like me, members of the Democratic Party. But, the Philadelphia Home Rule Charter does reserve a number of elected positions for officials who are not a member of the majority party. In recent decades, the Republican Party -- the other "major" party in Philadelphia -- has failed to bring much to the table in terms of viable policy initiatives or credible political alternatives. We can and should do better by filling the seats reserved for non-majority-party representatives with truly independent candidates. Voices For Change On City Council? For the at-large members of City Council, the City Charter offers a novel way of preventing single-party dominance. Each party is only permitted to nominate five candidates for the seven at-large seats. Voters are permitted to vote for five candidates in the Primary Election and again in the General Election. This way, political parties cannot completely shut out a minority voice. In theory, Council Members from the non-majority party are supposed to be a check on the actions of the majority party. The Home Rule Charter is annotated with this comment, "Minority representation is assured by the requirement that no more than five candidates may be elected for Councilmen-at-large by one party or political body." Our world now snickers at the notion of a council comprised of men only, but the idea that the Republican at-large members of Council represent those who are not spoken for is now equally laughable. The minority that needs representation is the group of Philadelphians who want the city to work for us all, and not just for the politically connected. If the Grand Old Party is not a place to find politically independent thinking here in Philadelphia, we should think about electing actually Independent politicians. Every voter gets five votes for City Council at-large, and since the five nominated Democratic candidates are basically assured of their election, even the most party-faithful can spare a vote for a truly independent voice. Change The Voices On City Council! Running for City Council At-Large as an Independent Candidate is Andrew Stober, a former official in Mayor Nutter's administration who helped establish the Indego bike-share system, promoted pedestrian-safety efforts, and worked save city government millions of dollars through reduced utility costs. Andrew, his wife, and young son live in South Philadelphia, so he is well invested in the city's future. Smart and talented, he is the kind of resident Philadelphia struggles to retain and his is a perspective that would be extremely valuable on City Council. 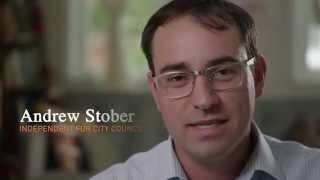 You can visit www.andrewstober.com to find out more or check out Andrew's first campaign commercial https://youtu.be/ATBG7vMI0c4 to learn more about his candidacy. I encourage you to check him out and to make him one of your five choices for Council At-Large. Philadelphia lacks forward-thinking leaders, so we should do all we can to encourage and elect better candidates. I know and like a lot of those rare Republicans in town, but I can't say that Philadelphia's Republican Party offers enough to move Philadelphia forward. By using one of our five votes for Council At-Large to support an independent voice for positive change, we can make Election Day Independent's Day for Philadelphia.